I just finished to give a 3-minutes pitch at ICTOpen 2018, the conference for ICT-Research in the Netherlands. 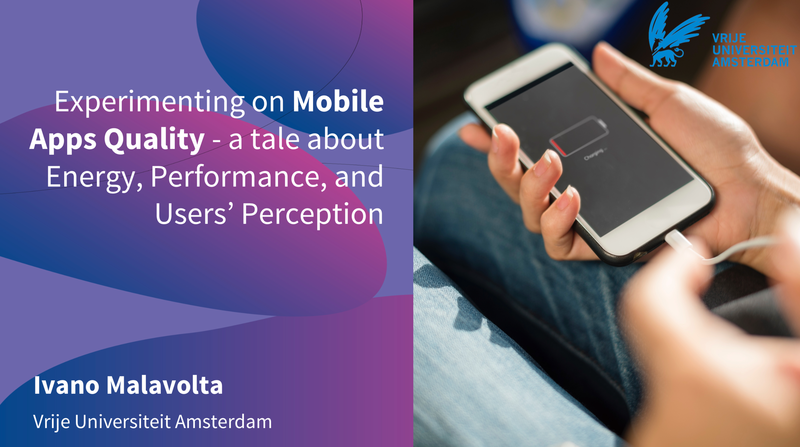 In this pitch I present and discuss a series of experiments we designed and conducted on mobile apps development within the S2 research group of the Vrije Universiteit of Amsterdam. The pitch aims at providing both researchers and practitioners a flavour of the various technological and empirical strategies that can be applied in this field. Experiment 1 targets web apps, run-time measures, and energy efficiency by assessing the impact of service workers on the energy efficiency of Progressive Web Apps (PWAs) [MobileSoft 2017 paper]. Experiment 2 targets native apps, mining software repositories (i.e., GitHub), and performance by building a checklist of performance-related aspects of Android apps [ICSME 2016 paper]. Experiment 3 targets hybrid apps, app store analysis, and users’ perceptions via a large-scale study where the Google Play Store has been mined and analysed via information retrieval techniques [MobileSoft 2015 paper] [Mobile Services 2015 paper].